In a close-fitted, knee-length tailored coat, with a rose tucked into the buttonhole, and churidaar, Jawaharlal Nehru made a style statement that went on to become a fashion trend. “In his capacity as the leader of the nation he created a look unique to India and made it global," says designer Raghavendra Rathore, who has become synonymous with bandhgala and jodhpur trousers. Rathore gets many requests for what clients call the Nehru jacket. 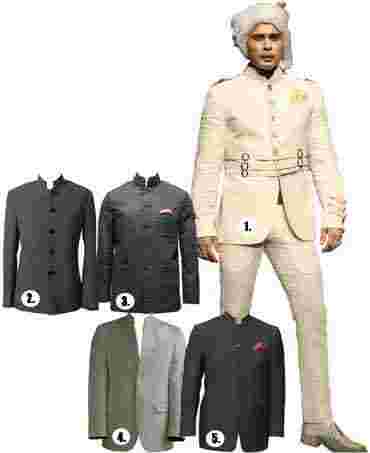 “But when they say Nehru jacket, they visualize a jacket with a bandhgala collar," he says. The Range: 1. Arjun Khanna: Linen bandhgala with leather belts, at 14th Road, Khar West, and Aza Men, Kemps Corner, Mumbai, approx. Rs50,000; 2. Manish Malhotra: Grey tweed bandhgala, at The Collective, Palladium, Phoenix Mills, Mumbai, Rs38,000; 3. Raghavendra Rathore: Classic woollen bandhgala, at DLF Emporio mall, Vasant Kunj, New Delhi, Rs40,500; 4. Park Avenue: Jacquard bandhgala, at all Park Avenue stores, Rs7,999; 5. Canali: Black bandhgala suit from the Nawab collection, at JW Marriott, Juhu, Mumbai; and DLF Emporio mall, Vasant Kunj, New Delhi, Rs79,500.Photographs by Abhijit Bhatlekar / Mint, Shriya Patil / Mint and Sudhanshu Malhotra / Mint. According to designer Ritu Kumar, achkans are knee-length or longer coats of heavy brocade that were worn by the royalty in Lucknow. “Nehru started wearing them in khadi, with a white churidaar and always knee-length, and made them his trademark," she says. Rathore’s speciality, the suit-length bandhgala jacket, is quite popular with his clients. “A coat of the length Nehru used to wear cannot be worn with trousers. Men now prefer the bandhgala look in a suit-jacket length because it can be worn with formal jeans or trousers." If a thoroughbred Nehru look is what you want, then Rathore suggests wearing a bandhgala waistcoat with a kurta and churidaar for the summer. “A modern interpretation is a futuristic bandhgala jacket with a zipper in the front, worn with jeans," he says.